Relics from the Longxing Temple in East China are exhibited in Beijing ahead of the World Congress of Art History, Lin Qi reports. Two decades ago, construction workers discovered a cache while digging a foundation for a school in Qingzhou city in East China's Shandong province. Then, archaeologists found it belonged to a relic site of the Longxing Temple that was built around the fifth century and demolished some 800 years later. The archaeologists were surprised to find that an art trove had survived underground for centuries. They unearthed several hundred Buddhist images that were made of various materials and traced back from the Northern Wei (AD 386-534) to the Northern Song (960-1127) dynasties. The richness of Qingzhou's storage pit of Buddhist statues shocked the country, too. The discovery was ranked among the top 10 archaeological findings of 1996 in an annual, nationwide evaluation backed by the State Administration of Cultural Heritage since 1990. Since the discovery, the statues have been widely exhibited, delighting audiences at home and abroad, and information on them has been included in many textbooks on art history. Now 50 sculptures from the Qingzhou cellar are on display at the Central Academy of Fine Arts, as part of a special exhibition for the 34th World Congress of Art History, held in Beijing from Friday to Sept 20. Visitors are bound to be overwhelmed by the statues' smiles as well as their clothes. Exhibition curator Zheng Yan, who is also a professor of cultural heritage at the CAFA, had mixed feelings when he first saw the artworks in 1997, in the storehouse of Qingzhou City Museum where they have been kept and restored after being excavated. "It was a startling scene. A bulk of the images had been broken into pieces of varying sizes. They were scattered all over the floor," he recalls. "Researchers at the museum managed to piece together nearly 100 fragments to see a statue's original form, while I heard there were several hundred more in need of sorting out." It took professionals years to finally reassemble some 400 statues with some of their fingers, hands and arms still missing or incomplete. Also, there are a lot of broken pieces that can't be restored and part of them are shown at the exhibition at the CAFA art museum. As the exhibition title Smashed and Reassembled suggests, Zheng hopes the juxtaposition of mended sculptures and groups of fragments can bring new perspectives to the viewing of Buddhist art. Yang Zhongkui, director of Qingzhou City Museum, says the production of Buddhist statues unearthed from the storage pit spanned nearly five centuries and the earliest dated to AD 529. He says many sculptures feature a high back screen carved with intricate raised patterns that form the distinctive "Qingzhou style". The statues, Yang says, were made of stone, jade, iron, wood and clay. The highest is 3.2 meters. They boast varieties of sculpting techniques and ornaments, providing extensive information for both archaeologists and art historians. 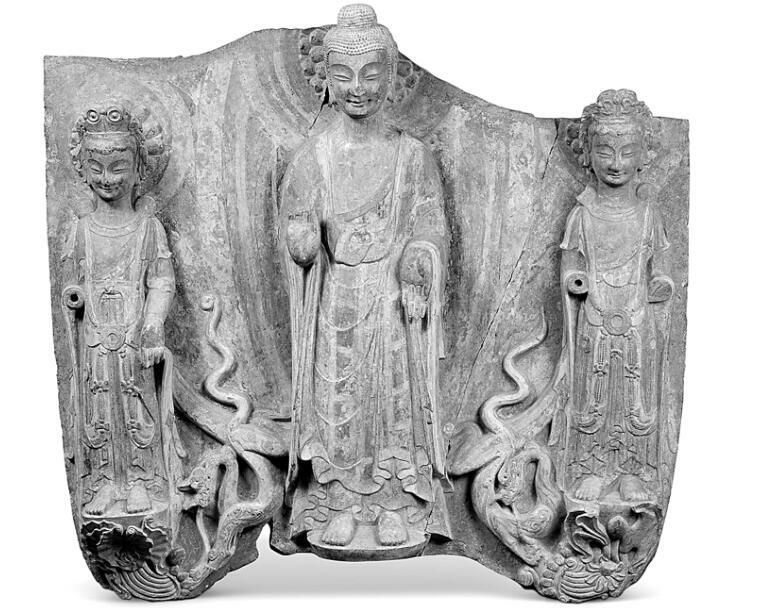 Many of the images were subject to damage of varying degrees - repaired and destroyed again as scholars speculate that the statues fell victim to two wholesale persecutions of Buddhism in China. The first was during the reign of Northern Zhou (AD 557-581) Emperor Wu, who ordered Buddhist and Taoist temples destroyed because he felt people were spending too much time in them. After the Sui Dynasty's (AD 518-618) founding Emperor Yang Jian took power, the clergies of Longxing Temple restored the remaining statues and sculpted new ones. But the sculptures of great artistry were destroyed when Emperor Wuzong of the Tang Dynasty (AD 618-907), himself a devout Taoist, abolished Buddhism in the country. The statues were possibly buried after people found it impossible to repair the damaged ones and buried them in the storage pit around 1026. Zheng says the remaining statues and broken pieces were placed in some order when found in the cellar, and it suggests that there could have been a burial ceremony. He says it was a way for Buddhists at the time to achieve relief after something disastrous. "The sculptures were seen as incarnations of the Buddha. People believed after being damaged, the surviving parts of statues were still endowed with sacred powers, like the Buddha's relics. "With great devotion, people collected and buried them, hoping that they would be well preserved underground." Also, people believed the smashed pieces would someday be reunited with the missing parts and reassembled, implying the arrival of a new age, he says.